Luna is our Solar System’s innermost satellite planet, and the only natural satellite of Earth. It is often simply called “the Moon,” but I prefer “Luna,” its Latin name, to distinguish it from all other natural satellites, which are also called “moons.” There are many other names around the world for this planet, including “Selene” (Greek), “Al-Quamar” (Arabic) and “Chandra” (Sanskrit). Luna is believed to have formed just over 4.5 billion years ago when Theia, a hypothetical Mars-sized planet, collided with the still-forming Earth. Theia is believed to have been co-orbital with Earth, creating a low-speed impact that allowed Earth to absorb Theia’s core. However, some of the planetary material was ejected, and re-solidified in Earth’s orbit as the Moon. 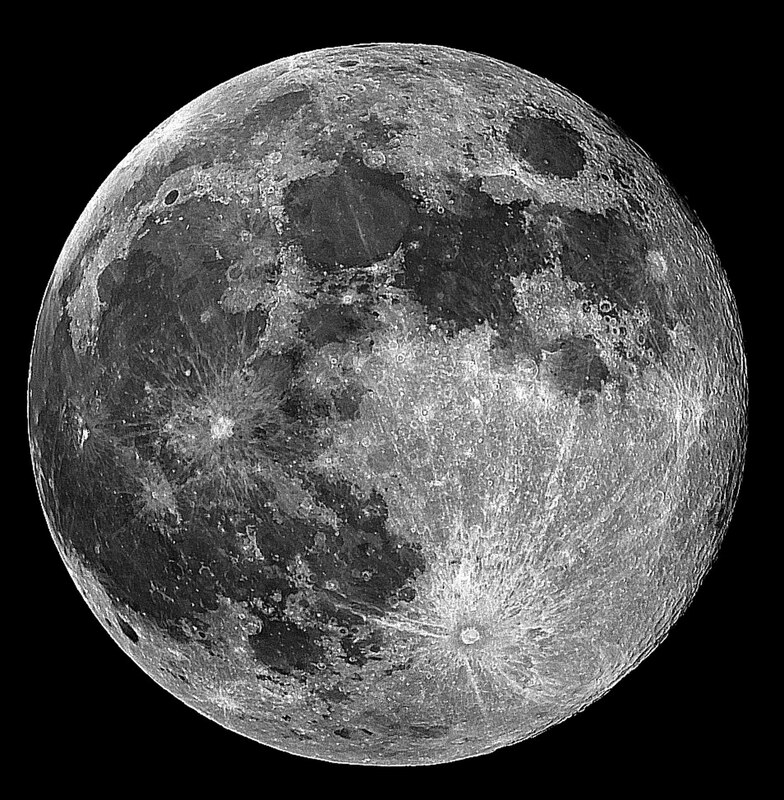 Luna is the 5th largest satellite planet and 14th largest planet in the Solar System overall. Luna is about a quarter of the diameter of Earth and 1/81 its mass: the largest satellite of a major planet relative to the planet it orbits. Having such a large companion, a second planet sharing its orbit, has been good for the Earth, giving it great stability over the eons and anchoring it against shifts in its orientation that could have produced radical climate change. Luna is a Size-I planet, a little smaller than the smallest terrestrial planet (Mercury), but a little larger than the largest known dwarf planets (Eris and Pluto). Its diameter of 3,473 km (2,158 miles) is less than the width of the United States, reaching only from New York City to about Elko, Nevada. Its surface area is 37,930,000 sq km, which is about 7.4% of the Earth’s (roughly equal to the area of Africa and Australia combined). Gravity on the moon is 1/6 of that on Earth (16.7%). Although we are used to seeing it in the sky every night, our moon is unique among all of the moons in our Solar System for many reasons. While we usually think of Luna as revolving around the Earth, both planets actually revolve around the center of gravity of the two planet system, a point located closer to Earth’s surface than to its center. More than any other moon, Luna behaves almost as an independent planet, its motion determined more by its revolution around the Sun than by its dance with the Earth. It revolves around the Earth not at the Earth’s equator, as with most moons, but near the plane of the Sun’s equator. Indeed, if the Earth were to suddenly disappear from existence, Luna would still be capable of dominating its orbit around the Sun and would easily be seen as a major planet in its own right. Luna is affected by its larger companion in some ways, though. The most significant are the tidal forces, which have caused Luna to became “locked,” so that the same side always faces the Earth. This means that a day on the moon is equal to its revolution around the Earth, which takes about 27.3 days. However, since the Earth is also in motion around the Sun, it takes slightly longer – 29.5 days – for the same phase of the moon (for example, full moon to full moon) to be seen from Earth. (Likewise, the Earth appears to go through the same cycle every 29.5 days for those viewing from the near-side of Luna, but the phases are reversed: when Earthlings see a new moon, Lunarians see a full Earth, and vice-versa.) Its year is the same length as its companion’s (365.24 days), but Luna has almost no axial tilt, so it does not experience great seasonal variations as the Earth does. Its temperature varies from -233°C (-387°F) at night to 123°C (-253°F) during the day. Luna’s composition resembles that of the other planets in the inner solar system. 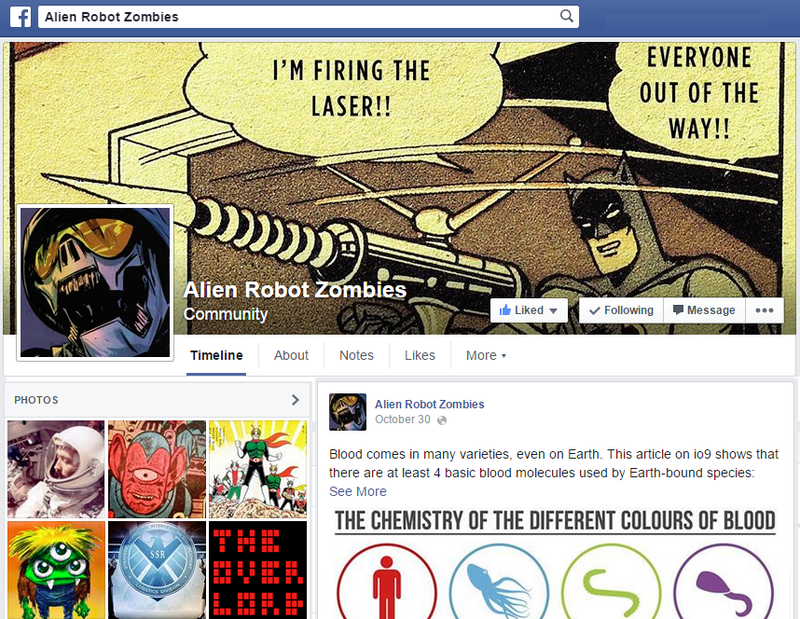 It is fully differentiated, with an iron-rich core surrounded by silicate rock. It has only the faintest of magnetospheres, not enough to provide significant protection from solar radiation. There is some evidence of water on the moon, but exactly how much is unknown. There is no liquid water or ice on the surface, where the solar radiation would cause it to rapidly dissipate. Presently, it does not appear likely that there is more than a trace amount underground, although there may yet be deposits at the poles. Although it looks very bright to us on Earth, that is only because of its proximity, as Luna’s surface is actually quite dark, similar to coal. The darkest areas are the basaltic lava plains, called maria, which fill about a third of the near side (but only 2% of the far side). These lava fields were all formed billions of years ago, as Luna is not geologically active today. The remainder of the lunar surface is covered in lighter highlands, or terrae, which solidified from the molten magma ocean as Luna was forming. 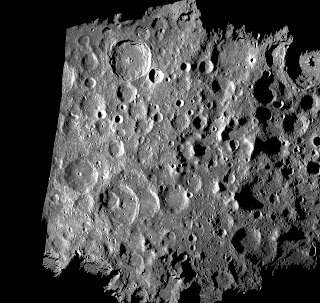 The entire surface, and especially the older terrae, is covered in impact craters made over billions of years. Because Luna is not geologically active and has almost no atmosphere, those craters have been preserved for eons. 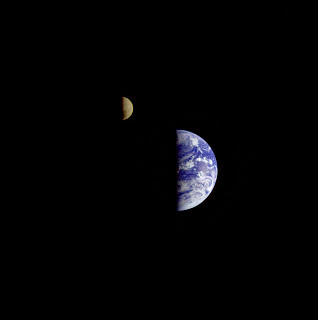 Luna and Earth are separated by an average of only 384,399 km (238,854 miles). That’s the equivalent of circling the Earth at the equator 9.6 times. Luna is near enough that its large surface features can be discerned with the naked eye, and individual craters can be easily spotted with a telescope. By a coincidence, Luna’s relative size from Earth is almost exactly the same as the Sun’s, allowing Luna to completely eclipse the Sun when it is lined up directly between it and Earth. 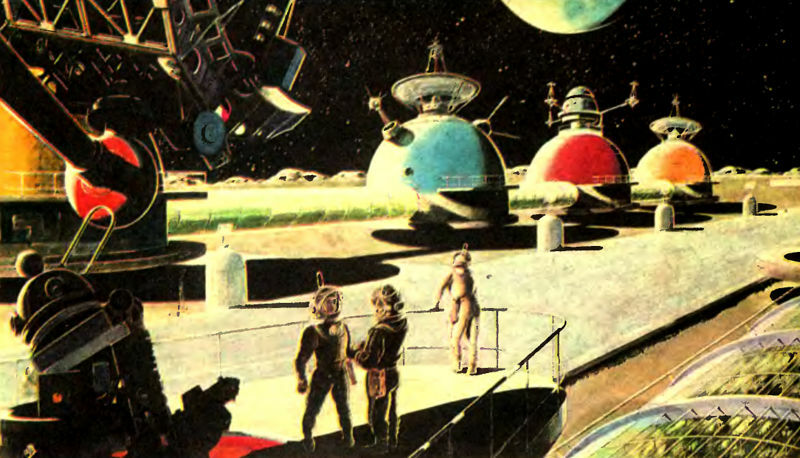 As humans became a spacefaring species, traveling to Luna became seen more and more as a possibility. On the evening of July 20, 1969, that dream was finally realized when U.S. astronaut Neil Armstrong became the first Earthling to set foot on another planet. His fitting first words back to Earth were: “This is one small step for man, one giant leap for mankind.” Five additional manned missions were made, the last one in 1976. No human has set foot on Luna since that time. The moon will be our first permanent home outside of Earth. In 1969, it took astronauts three days to reach Luna, and this time will be greatly reduced in the future. And communications between Earth and Luna take only three seconds, meaning that residents of Luna could be full participants in Earth culture. The cost of manned missions between earth and Luna will also become more reasonable, especially once space elevators and other technologies reduce the burden of escaping Earth’s gravity. This will open up the moon to science, industry and space tourism. While Luna does not have many natural resources of interest to us, it does have deposits of helium that may prove valuable. Mostly, however, Luna will be useful as a low-gravity base from which to launch further space missions. The effects of Luna’s low-gravity environment on human beings is not yet fully understood, but will be carefully studied as the first lunar crews rotate in and out. Other obstacles will also have to be overcome, such as dealing with the extremely abrasive lunar dust, nutrient-poor soil, and the lack of atmospheric protection from solar radiation and meteors. Eventually, however, science will develop solutions to all of these problems, further opening up human exploration of the cosmos. Although industry may make it possible to give Luna a temporary atmosphere, it will not be sustainable over the long term due to solar radiation, and making it hospitable to humans may be more trouble than it is worth. More likely, any atmosphere created will be in the interest of providing additional protection against solar radiation, while human settlement will remain restricted to air-tight artificial complexes. Traditional agriculture may be possible in domed greenhouses near the poles where sunlight is constant, but the two-week long nights will make it nearly impossible elsewhere without artificial light. For farms, factories and settlements on the near side of Luna, those lights will be visible from Earth, so that future generations will finally think of Earth and Luna as a true two-planet system. Luna is populated by the Posterions, a flat, silicon-based life form about a quarter-inch deep and up to four miles in diameter. Posterions are very slow-moving, combing the lunar surface inch by inch as they feed on nutrients deposited by the solar wind. Like deer in headlights, they freeze completely when in direct sunlight. This, coupled with their rocky appearance, makes them invisible to even the strongest Earth-based telescopes. Although they have no appendages, no tools and no industry, they are extremely intelligent. Their advanced culture is based entirely on theory: while they have no concrete music, art or science, for example, they have philosophical discussions of all of these, and very complex (and also very wrong) theories about the nature of the Universe. Until recently, the Posterions believed their rather large moon to be lifeless, under the mistaken belief that life could not exist near anything blue. They were proven wrong in 1969, when aliens arrived on their world and promptly drive a striped and starred spike through the heart of their theoretical supreme leader. The Posterions immediately began planning war upon the invaders. They spent the next several decades conceptualizing the ultimate weapon, and then – for the first time ever – actually moved beyond theory and built the device. On October 9, 2009, they aimed it at the Earth and prepared to fire, only to be hit by a preemptive attack from the U.S. under the guise of a NASA science experiment.